The La Times had an interesting article about the Dodgers spending habits and the luxury tax. After seeing how Andrew Friedman operates over the last four years we can make a judgment on how he runs one of the largest market and richest baseball clubs in the world. The Los Angeles Dodgers, one of the clubs that leads the majors in payroll has nearly a 200 million dollar payroll. However the team clearly refuses to compete for any of the top free agents on the market despite the inaccurate media reports. So the question has always been how this decision to not add any high market free agents to the roster was made. 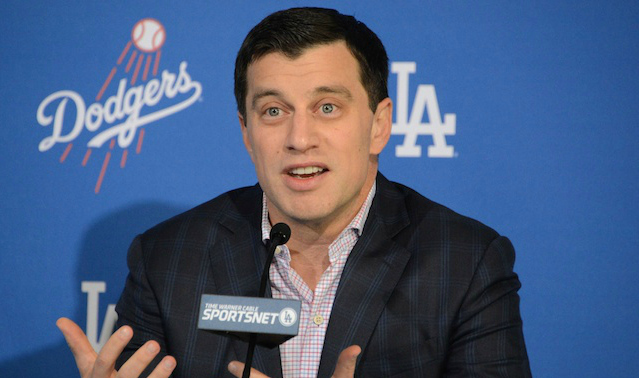 For the record the Dodgers have yet to sign any free agent for more than 60 million dollars since Friedman and his cheapskates rode into Los Angeles. The LA Times article shed some light on this. Is Friedman just cheap? Is he small market minded? Or did the decision come straight from Mark Walter? We now have our answer. The decision did not come from Walter. Nope, Friedman is just cheap folks. He’s small market minded. He just can’t resist the urge to not spend money on some of the best players in the game. I’m not saying the Dodgers don’t spend on quality areas such as scouting and development, analytics, and international players. They certainly do. However the Dodgers spending on a player such as Bryce Harper, or Dallas Keuchel, players who could potentially put the Dodgers over the hump from very good National League pennant winners, and World Series losers, to super club and World Series champions will never happen under Friedman’s watchful penny pinching eyes. The Dodgers did make moves this winter. They did sign Clayton Kershaw to a 93 million dollar extension. They did sign outfielder A.J. Pollock to a 55 million dollar deal, and they did trade Yasiel Puig, Matt Kemp, Alex Wood, and Kyle Farmer to the Reds for a handful of magic beans. They have payroll flexibility! Yet the perceived notion was that all of that was in order to make a run at Bryce Harper. But that’s not going to happen. Harper seems to be on the verge of signing with the Phillies. The Dodgers are just cheap folks. There was no mandate from Walter. There are no hidden conspiracies. There’s no one hamstringing Friedman’s spending abilities. There are no white horses at the Dodger’s door. No, Andrew Friedman is just cheap. Honest to goodness, frugal. One of these days maybe someone can use a crowbar to help pry open that wallet. Until then don’t hold your breath. Scott. you are right on! And Boston won the WS because they had a superior team to ours and were not overwhelmingly worried about going over that CBT. And no MLB team, including those like the Dodgers, Yankees, or Red Sox will win its division every year. The Dodger’s window of opportunity for a WS ring is diminishing , as we all know it is very very reare to see ANY team make it 3 Ws appearances in a row. Frugal, yes. That suggests prudent. Cheap? He does like dumpster diving, but with payroll what it is, and large contracts given to a select group, I’m not going as far down the ladder as cheap. Circumspect, calculating, is, to me anyway, more applicable. I have come to terms with how it is Friedman operates. He prefers to avoid those extra years that he believes are anchors. It’s accepted fact now that players peak before 30. Why pay top dollar to players more than a few years past their prime? He felt Kershaw was worth the investment to age 33. He felt Greinke wasn’t worth it to age 37. It’s a gamble, and we won’t know if he’s right about those two for some time. But we do know his methods. I didn’t much care for the $16 million pitchers he whiffed on, but I do like we’ve been in the playoffs every year he’s been her choose to br grateful rather than pissed. I’ve been pissed enough over the years. Time to spend more time on the bright side. I figure we’ll be competitive for years to come. But, the Division soon won’t be the pleasure cruise it’s been. Not after this year. The window is still open…. Well, Scott. I don’t think your logic is airtight. As I and others have pointed out, we have no idea what he has been told to do from ownership. This factor is the all important factor in jumping to the conclusions that you made. The team is winning and going to the WS. The Astros didn’t make it last year. Do we sit around and complain and analyze why oh why they didn’t make it? No, because Boston was blazing last season. Everything came together for them, and boom! That same everything has not come together for the Dodgers. Conceivably, you can blame AF, but without knowing the ownership mandate, conclusions about AF being cheap or not, cannot be made with any accuracy. It’s not even his money! If he had all the money at his discretion, what GM wouldn’t go out and buy some top talent? For me, if I want to guess why the Dodgers are not signing top FA’s, the answer would lie with ownership. Either they want to milk the cow for all it’s worth, or they really have faith in AF’s ability to win and keep costs down. Ownership just told you that they did not make any decisions to limit Dummy2 and Kasten. Ownership mandate is let Dummy2 run the Dodger Organization. He did and he is running it. Running it into the ground. No high dollar Free Agents allowed. He is turning the team into Tampa Bay west. Small market mentality. The team is small market vanilla. Package, there is so much silly and incorrect stuff in that one post it’s almost mind-boggling. Pack, Try to think a little deeper. I read that story. Very interesting since he is the controlling owner. He more or less has complete control of the purse strings. The thing that intrigued me is that this basically throws both Kasten and Friedman under the bus. Everyone was talking about the paper that circulated that stated that ownership had mandated staying under the CBT for the next 4 years. It was one of the reasons I kept saying, Harper is not coming because he automatically by himself puts them into the penalty. Those die hard lets go get Harper folks now have some fodder for their anger, and you can bet there will be fans who take this as a time to take their shots at Ol Andy. It is kind of funny that this story broke today, and that Andy was on the TV broadcast with Orel and Joe. And it went like all of his interviews this winter have gone. Same old story. We do not have any weakness and our roster will be more consistent. Even though I have watched both games, I still do nor know what the hell Von Scoyoc looks like. There is no photo of him on the Dodger web page, and if he has been onscreen, neither Joe nor Orel has identified him for us. But I sure know what Dino Ebel looks like and he is one ugly dude. They hit 4 homers off the Halo’s today and came back after blowing a big lead. DJ Peters, who is really ripped by the way, hie 2 bombs. His second one was a mammoth shot that went all the way over the sidewalk and over the fence where the clubhouse is. Beatty hit one too. I’ve said this before and often, it is an ego thing with Friedman. He desires to have a Billy Bean reputation. Seriously, use your head, evaluate what you have seen from him, he is consistent just like CNN and MSNBC with fake news broadcasts. Sticking with that nonsense hey True? They are all corporate owned. I read this morning that we are back in on Harper. It could maybe be done with only one year putting the team over the tax limit. I think it can anyway. Maybe Cleveland would be interested in Pederson + in a Bauer trade. Bear’s right. Our roster 1-35 looks pretty good. No real need to get better – right? No Badger, just wanted to send a message on how STUPID little jabs are, you see, I like to use absurdity to highlight others’ absurdity. Glad you got the message, so let’s move, yes? My real point of the post, was again letting others see that it is ego at play in why AF wants to dumpster dive continually. You want to actually address that or just go for the low hanging fruit? I’m not buying your ego analogy. Not entirely anyway Of course ego is involved. It’s always involved. Everywhere. We are all born with ego, from the crib to the coffin we are developing and marching forward with ego. But it isn’t the only thing that drives Friedman. I find that reasoning rather narrow. There are dollars sense applied to his methods. I don’t agree with everything he has done but I do accept his methods. They’ve proven to be relatively sound. We win a lot. By nearly every measure the team, and organization, are wildly successful…. what’s not appreciate about where we are? Second best two years running. Is this the year? Yeah. Sure. Maybe. I kinda doubt it. Good to know you are just setting traps here. I won’t take you seriously from here on. I actually never said ego was the only motivator for AF, however it is a big part of his motivation. The only logical line that I can see the Dodgers taking is to convince Harper to sign a 1 or 2 year contract, win a World Series with the Dodgers, and the ceiling on a long term contract would go up from there, not necessarily with the Dodgers. Winning a WS has to appeal to any baseball player who loves his sport. All the Dodgers have to do is convince him that he is the missing piece and the universe has conspired to put him in this position to get it done. Would any of you take the long term money, hundreds of millions, or sacrifice it for winning a WS now? He’s made $40M in the last 3 years without endorsements, etc. He doesn’t need the money right now. Who knows, this might turn into something. There are many creative ways to make this happen. It doesn’t need to be a 2 year contract, it could be 7 with escape clauses for both parties. By the time Harper reaches his coming declination years the NL will probably have implemented the DH and if everyone is getting along he could re-up and continue hitting for us. The amount of endorsement money in LA could be added incentive for Harper to be less demanding in the negotiations. This could happen if they are all willing to sit down and work it out. There goes Dummy2 again. He always allows the Dodger fans to believe that they are in on this player or that player but never delivers. That way he can say “Well, we tried but just could not get it done”. I have been watching Dummy2 since he got here and it is his MO. If the Dodgers sign Harper it will be a 1st and a miracle. If he ever told the truth and said its too much money or we are not paying high priced Free Agents all that money, the fans would hate him just like I do. More vanilla. Just my opinion. Well, you could be right of course. I think they are genuinely interested. But…. I won’t be surprised either way. Any talks about Harper could end on Tuesday, when many believe he WILL sign with the Phillies because it’s said they are the only team willing to go long term..
Harper has said he will make his decision by the end of the week. And the entire baseball world waits with baited breath. Not me. If he signs with the Dodgers it was meant to be, if not, I will not lose a nights sleep over it. He makes the lineup longer, but he brings little defense, from all accounts, not a great attitude. Maybe that changes. I still do not believe that he alone makes the Dodgers instant world series favorites. I still think the pitching is going to have to be better than it was last year for that to happen. They cannot afford injury or bad years from any of their starters. Pitching wins championships. BoSox proved that last year. As was reported earlier, Harper does not even rate in the top 5 in the slugging catagory’s over the last 5 years. Trout is #1 in those stats. I pretty much agree with ya here Michael. 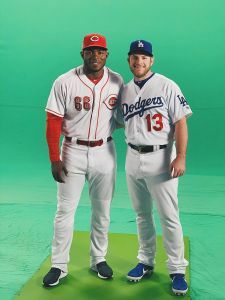 Ya know everyone talks about how Dodgers were an HR or bust last year and that was true. However, as you say, it’s pitching that does win WS Championships. And yes Dodger lineups in the WS left a lot to be desired. But the big problem IMHO in these past 2 WS losses WAS a pitching staff unable to keep the baseball in the yard. 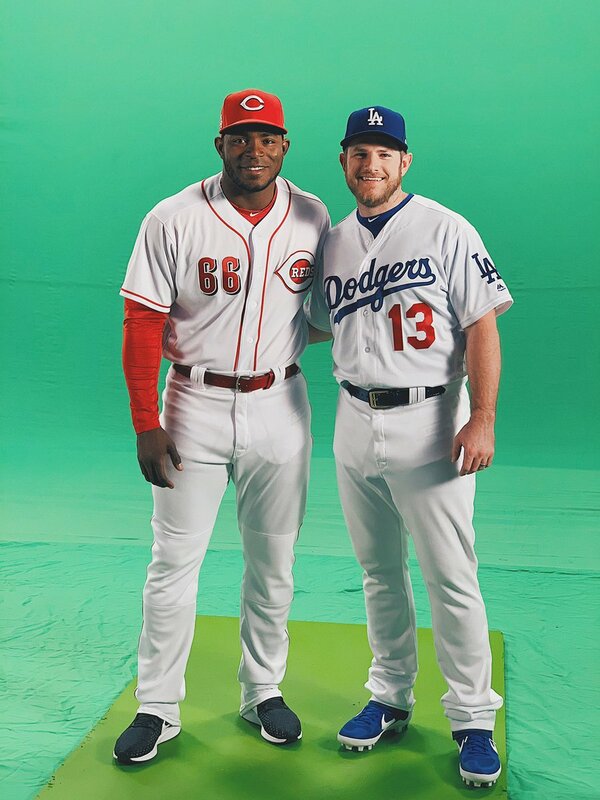 Let’s see here…And it bears repeating… in 12 games combined over these last 2 Fall Classics, Dodger pitching served up 23 HR’s!!!!!!!!!!! The Astros hit 15 of them in 7 games, while the Red Sox hit 8 of them in 5 games. Pitching really is the key, it ultimately boils down to that if a WS is in the cards. We have had an explosive line-up, not always consistent (feast or famine), Barce Hyper might add a little more balance to the meal but his offense won’t be the difference maker in winning WS. As Paul points out, you can’t five up 23 HRs in 12 WS games, it just ain’t gonna produce a championship, it does produce awesome stats for the opposing hitters. No doubt the HR has killed us in the WS. 12 of those HR’s were given up by the bullpen. Jansen gave up 4 HR. Kershaw gave up 5 HR!, and went 1-2 in W-L for those 2 series. You might say our Ace and our Closer lost both the series for us. It would be a little simplistic pinning it solely on them as it is a team game. This season, the bullpen has changed and Jansen is claiming a new found zest in his chest and a more streamlined body. He has done something about his heart condition. The docs say he is 100%. Unfortunately, we cannot say the same about Kershaw. After all, he is our workhorse and he is not an ironman. IMO, entirely too much attention is put on him and we have always rose to the occasion when he has been out hurt. We now have 3 wild cards waiting for their chance to start, Ferguson, Ryu, and Urias. Our weakest starters beside Kershaw (physically challenged), are Maeda and Stripling. Both of these pitchers are probably better off in the pen doing long relieving. Unless I’m wearing blinders, I don’t see much of a weakness in our pitchers subtracting Kershaw from the equation. Our pitching doesn’t stink. Offensively, we were challenged to produce runs with RISP. We were prone to slumping throughout the year both collectively and individually. I don’t think that will be the case this year, but we’ll see. Adding a bat like Harper’s, will help with consistency. After all, he is considered elite with no issues ala Machado (the Smirk). The All or Nothing approach should not be in effect this season. This doesn’t mean we won’t slam the ball out of the park almost every game. Barring injury, we should see a better lineup. A new approach to batting is already being installed in ST and it seems to be working so far. This team is not sitting on its rear end doing nothing. They are working on improving their weaknesses so i don’t expect a repeat of our major problems of 2017/2018. Injury is my main concern. We’ll see soon enough what they’ve got. Hey there, Jeff. All true what ya say except having an all LH rotation, or just 1 RHP (Buehler) is not the greatest of ideas. As far as the offense goes those issues ya mentioned were a direct result of all the excessive platooning, and that was because the majority of these position players cannot do well against both sides of a pitcher. Not only the LH batters but also the RH batters had problems with LHP last year but it was in line with many being in and out of the lineup daily and not knowing where in the order they are hitting from 1 day to the next and moving daily from position to position. Bottom line was that Dodgers were able to get by with that in the regular season but in the PS and WS, where the elite teams are, it won’t get the job done when it matters the most. 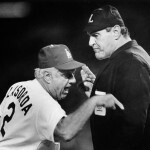 Paul, I was not a fan of how the Dodgers played last season. In fact, they sucked for the 1st half of the season with only Kemp keeping them in it. This is not the same team. Last season, was an audition of the pitching army they assembled, and in spite of it, made the WS! Lucky, huh? This year, every part of the lineup is more considered and more deliberate. The possible addition of Harper and the young pitching tigers waiting for their chance, Ferguson, Urias, Santana, Gonsolin, May, and White, make this the deepest team in years. What else can I say? They are an elite team. I would sign Harper to a 2 year $62 million contract with a third year team option. That is what we went below the luxury tax threshold for, wasn’t it? Harper goes back to the FA market at age 28 or 29. As for the WS. despite 2 straight WS appearances our team has steadily gotten worse since the last year of Mattingly. We were close two years ago but Jansen and Kershaw blew games 2 and 5. We were crushed last year – I don’t think we (or MIL) could have beaten any of the AL contenders last year. YF, part of me wants Kershaw gone. I feel he is something like a weight around the neck of the Dodgers. OTOH, he is a damned good pitcher and I can see how the FO wants to please the fan base as Kershaw has been the face of the franchise for many years. I think he is holding us back from the next level. Kershaw isn’t the manager, he pitches when he is told to. If Kershaw has been overworked or pitched while injured, that’s on management, not the player. I don’t believe Kershaw is useless or actually holding us back, I think management is actually holding us back. For some reason, Kershaw isn’t a dominating post-season pitcher, if that is the case, management needs to adjust and not give him as many opportunities. BTW, don’t forget that Darvish was an absolute disaster (twice) against the Astros, to leave him out as a major culprit in that massive WS choke is just not being rational. Many players don’t fess up to being injured until what bothers them begins to be chronic. This is common in all pro sports. Athletes usually have a high tolerance for pain and will often ignore what seems to be small hurts in order to play. It is not on management in every situation. How could it be? I never said Kershaw was useless. In fact, I said he was a very good pitcher but seems to choke in post-season. What I mean by holding the team back is that I believe the team doesn’t expect him to stop playing every year because of injury. They have overlooked his susceptibility to injury, his body not holding up, and trying to rush the development of the farm players when they should be looking for another top quality pitcher, IMO. You may not agree with me, but many see the handwriting on the wall for Kershaw. It would make our post seasons much stronger. Darvish was a disaster, but I saw it coming before the post season when he first got here. He did not look in control of anything. It was a knee jerk move and is a good example of the FO not being pro-active in acquiring a proven ace. Darvish has never been an ace, ever. He certainly has the body to be one, but not the head. I left him out because he is no longer with the team. I left Morrow out, too. In the WS, he had 5.1 IP, 8 hits, 2 HR’s, ERA 8.44, 1.69 WHIP. These are numbers to be ashamed of. Maybe the design of this team just doesn’t produce playoff peaking teams. In theory it’s supposed to … everybody contributes, people are rested frequently, starting pitchers aren’t asked to start 32 and throw 180 innings, the bullpen is always stacked with good arms. Yet, every year Dodger hairballs are coughed up all over the October fields. I don’t see this year being any different. Buehler appears to be the only starter capable of taking the ball 30 times and though Jansen looks better, will he be better come October? Frankly I don’t expect much out of Kershaw. His DL frequencies the last 3 years have signaled to me his end is nigh. Oh, he will likely show flashes of brilliance but his ace days are behind him. He may not be present but that $31 million sure will be. I think I agree with those that say pitching in October will make us or break us. I’m not confident this team can roll til November. Jeff, then also look at the many good prospects Dodgers traded away during the past 2 trade deadlines for a 2 month rental in each case and guess what…we have zero in return for those deals just my thought here. Badger, see my post to Paul above. Pitching, we’ve got it. Harper got 13 yrs, $330M, no optouts? What a joke. Phils will regret it. Where will baseball draw the line? These salaries are getting rediculous! At least the Dodgers did not get suckered in. Good thing Friedman “IS” cheap!